From an innovative coating for joint replacements to a promising drug for the painful inflammatory disease scleroderma, 11 new biomedical ideas that emerged from research across Michigan have just gotten funding that could help them make the leap from lab to patient care. More than $2 million in funding has flowed to the teams developing these concepts from the Michigan Translational Research and Commercialization for Life Sciences Innovation Hub. MTRAC, as it’s known, is co-managed by the University of Michigan Medical School and Office of Research with funding from U-M and the Michigan Economic Development Corp. Projects from across the state were selected for funding by MTRAC’s Innovation Hub team to accelerate their paths to market, bringing them one step closer to helping patients and their families. Finalists for the funding, including teams from U-M, Michigan State University, Michigan Technological University, Beaumont Health System and Henry Ford Health System, presented project proposals to the MTRAC Oversight Committee at its annual meeting in Ann Arbor in early January. Those selected for funding include an antibacterial coating for orthopedic implants, a novel nano-vaccine technology and a potential next-generation cancer therapeutic. Award amounts range from $130,000 to $260,000 per project, supporting mid-stage product development activities that are critical steps on the path to market. The MTRAC for Life Sciences Innovation Hub, co-managed by the U-M Medical School’s Fast Forward Medical Innovation and the U-M Office of Technology Transfer, is a statewide program that supports translational research projects in life sciences — including medical devices, diagnostics, therapeutics and health-related information technology — with high commercial potential. 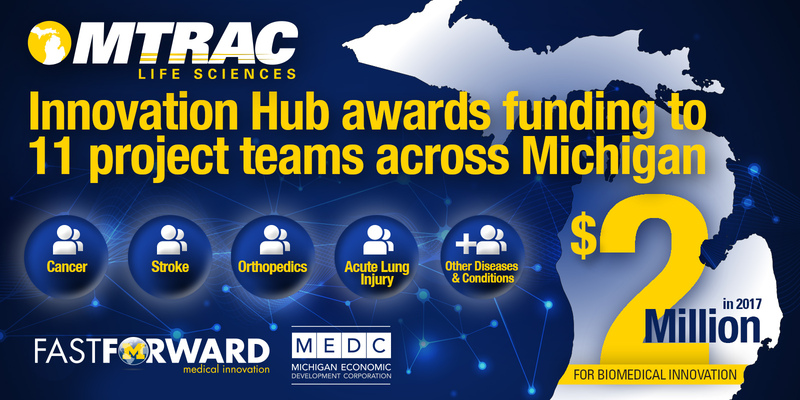 The $4.05 million statewide MTRAC for Life Sciences Hub was announced in mid-2016 by the MEDC after being approved by the Michigan Strategic Fund. To see all the project award winners, visit innovation.medicine.umich.edu/innovation-hub/project-awards.